It came from outer space and crashed onto bookshelves! This third entry in the award-winning How It Got to the Museum series traces how a rock broke from its billion-year orbit to fall from space onto the trunk of a teenager’s car, then to several natural history museums. Employing the cumulative narrative style used in How the Sphinx Got to the Museum (2010) and How the Dinosaur Got to the Museum (2011, both Blue Apple ), Hartland explains how the Peekskill Meteorite traveled from space to Earth, eventually finding a permanent place in the American Museum of Natural History in New York City. The artwork has a naive, folk-art quality, reminiscent of the work of Simms Taback and Grandma Moses. The attractive, colorful illustrations will appeal to children. Back matter includes information on Dr. Mark Anders, the first scientist who viewed the meteorite in Peekskill, and additional facts about meteorites. This engaging work is well suited for reading aloud or for budding geologists, scientists, or curators. As the Common Core State Standards place increased emphasis on nonfiction for young students, this groundbreaking effort fits the bill and does it well. 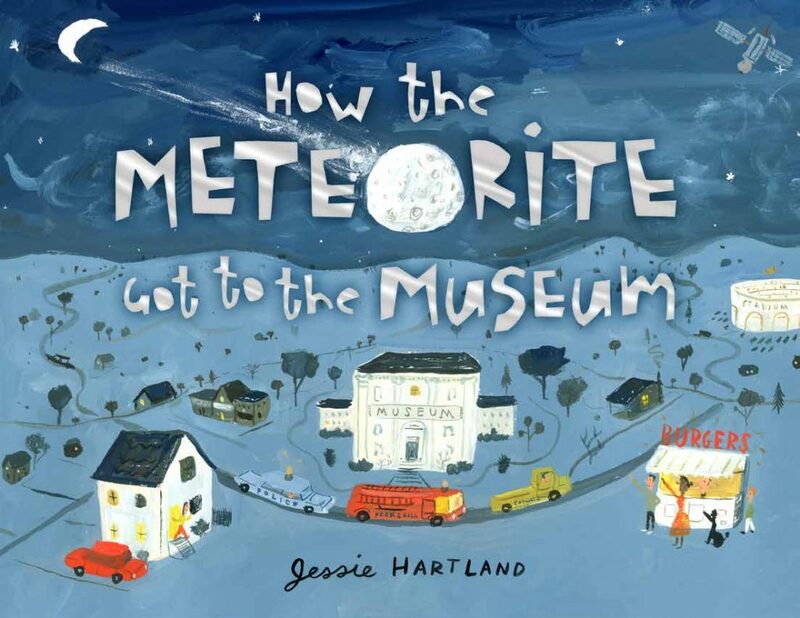 This companion book to Hartland’s How the Sphinx Got to the Museum (2010) and How the Dinosaur Got to the Museum (2011) opens with a class field trip, but it quickly backtracks when a student asks how a meteorite got to the museum. On Friday, October 9, 1992, a four-billion-year-old meteor entered Earth’s atmosphere over Kentucky, streaked across the skies along the East Coast, and crashed through the trunk of a teenager’s car in Peekskill, New York. The police examined it, firefighters cooled it with water, a geologist identified it, the museum’s curator of meteors obtained it, a cosmologist discussed it, and the exhibits team displayed it. Through a combination of narrative text, speech balloons, and cumulative lines using the familiar “This Is the House That Jack Built” pattern, Hartland infuses the dynamic story with human interest as well as easy-to-absorb information. Illustrated with eye-catching paintings in a vivid, naive style, this picture book adds another dimension to Hartland’s fine Got to the Museum series. NextDo You Know Which Ones Will Grow?